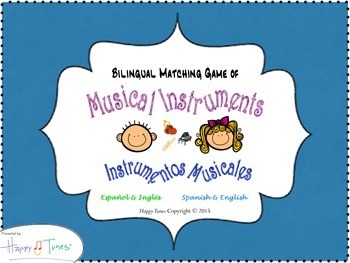 Bilingual Matching Game of Musical Instruments. 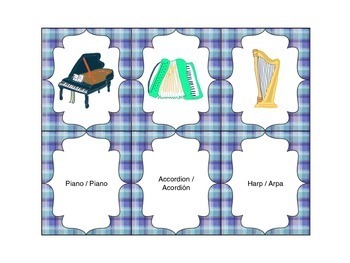 Juego de cartas para correlacionar las imágenes de instrumentos musicales con sus nombres. 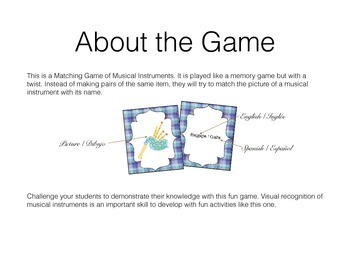 Here is a fun game for students to identify the picture of an instrument and match it with its name to the classical style of memory game. Instruments with creative and original images. Great for centers or as assessment. * Includes instruments from the orchestra and from around the world. * Just print, cut and play!. You could laminate them and even paste them on construction paper for a long-lasting result. Make as many sets as you would like!